Brett Jones and I are doing an event with StrongFirst called Foundational Strength, where we’ll be working with the FMS and a lot of the FMS Level 2 information but geared toward the StrongFirst community. Recently Brett and I spent a few minutes talking about some of the concepts behind our plan for the teaching weekend. And here’s the transcript if you’d rather read the discussion. For more information on the event, click on the Foundational Strength tab at the StrongFirst Events page, here. 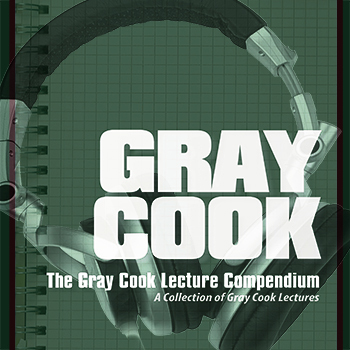 And if you enjoy audio learning, please also see Gray’s lectures on OTPbooks.com. If you’re going to think about movement, where should you start? Pavel’s new book Simple and Sinister is out. Gray’s listened to it twice (so far!) and has some thoughts. Today Gray talks about balance, and give some suggestions for regression drills. No moving parts? What the heck does that mean? What’s Gray talking about when he says functional dysfunction? Whenever we do something, we should start with why. Gray expands on that idea in this recording. What’s the thinking behind the Key Functional Exercises lecture? Play, Practice or Train—what’s the difference and which should we be doing when? When do you use the FMS? When the SFMA or the Y-Balance Test? Would you sometimes use both? Gray presents the strategy in today’s new Gray Cook Radio. Have you watched Gray coach half-kneeling positions, then seen other FMS instructors use different cues or appear to be looking for something different? Gray addresses this confusion in today’s new Gray Cook Radio. Asymmetry is one of the most talked about aspects of movement screening and corrective exercise. In this short discussion, Gray explains why, and also expands on the topic in this piece, which includes a new video clip from the Applying the Model DVD set. A recent query on Gray’s Facebook page triggered his expanded thoughts on using the FMS in a group setting, whether that be teams, fitness groups or bootcamps. Mark Snow expands on the topic in this talk: Using the FMS in a Group Setting. Stability training has been a popular training method in recent years, but are we thinking about it correctly? Is motor control a better concept? The benefits of barefoot training are many, but some of the results are conflicting. Why train barefoot—and when is it best not to? What does Gray mean when he says, “If you can’t touch your toes, don’t deadlift”? And for more, read this: What’s in a Toe Touch? What do you do when someone can’t perform a test due to a physical limitation? Today Gray tells us about his summer MovNat experience and his conversations with Erwan LeCorre. Here’s where to find Erwan and his MovNat workshops. Now here’s a fun one: Gray’s take on isolation exercises—What’s a bodybuilder to do? Today Gray talks about his Perform Better Pre-Conference Workshop. The full transcript is also available here. In this episode we discuss the workout, specifically where do correctives go and when do we re-introduce sports training after a problem is found in the screen. What exactly is dry needling? What does Gray use it for? The dry needling school Gray mentioned is KinetaCore. Last week’s coverage of breathing and heart rate variability wasn’t enough. Let’s get a little more. The monitor Gray talks about is the Polar FT80, and Polar’s overview of HRV is here. He also mentioned an iPhone ap called Ithlete, which you can find here. Here’s a link to the Functional Movement Screen workshop information. Does Gray have a Daily Desk Jockey movement prescription? What’s on Gray’s bookshelf as we move into spring? How do body proportions factor into movement screening? Why does Gray suggest the heels-in, toes-out stance in club swinging?